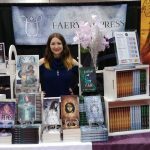 Keycon 30 wasn’t my first convention ever, but it was my first convention attending as Faery Ink Press. It was my first experience manning a table by myself (I’d manned tables before when I worked for ChiZine Publications), and it was my first time being an expert on panels. So as you can imagine, between manning a table and running around the Radisson Hotel, and talking to a lot of people, I learned a couple of things! Now, I’m going to share some of them with you. My signs were pretty blah. I bought some bright pink bristol board and after many failed attempts, produced two signs: one for my print books, and one for my eBooks. 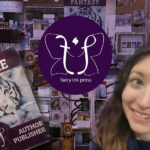 My eBook sign was a little more prominent because it was front and center–I was really pushing the eBook cards I’d made because they’re cheap and I wanted them to sell! But once and a while, people would mistake the eBook prices for the print prices. No, I am not selling my $20 book for $3. That would be insane! On Day 3, I ended up putting bookmarks in the print books with the prices written on the back. This way, the bookmark stood up, and the price was visible. This worked well. Next time, I’m going to have clearer signs printed so it doesn’t look like I’m running a yard sale. Another thing I’m going to invest in for my next con is a large sign. One that comes with a stand, and is over 7 feet tall. The pro to this: looks super professional. It can go to the side, behind me, or in front of my table. The con: if it goes behind, half of the sign is obscured. Some cons may have rules about how much space in front or to the side of your table actually belongs to you, so you will have to check the rules before the con itself! You also may need help setting up this unwieldly sign, and if you’re doing this all by yourself, this may be difficult. Tables came with white tablecloths, but that’s it. Bring your own tape to the convention, else you’re going to have to waste time running around finding someone else nice enough to lend you some. Wasting time = not good because the quicker you set up, the quicker you can start selling. I used my blue scarf as an extra eye-drawer, but I’m going to invest in a purple piece of fabric for next time. Purple is a Faery Ink Press colour, after all! I was also thinking of buying some flowers to dress up the display, but that could’ve been a problem, because so many people have allergies nowadays. Fake flowers could maybe work, if they’re not tacky looking. Book stands are another must-have. Fortunately my friend lent me some before the con, so I was good there. I may have to find some more for When Words Collide, however. 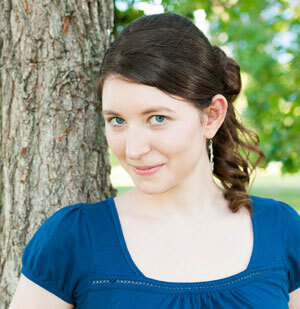 If you’re a one-woman publisher like me, you’re used to doing things on your own. Maybe you have a friend that’s willing to help you out manning a table. But if you’re in a strange city, and all your friends are off doing their own things (as they should be! They have their own books to promote! ), then you need to learn to cope. Food? Yeah, you better bring some to keep behind the table. Baby carrots, Larabars, cherry tomatoes: that was my snack food. I’m gluten intolerant so nipping out to Starbucks or the restaurant in the hotel for a snack wasn’t exactly a safe option for me. Drink lots of water. At Keycon, we were lucky because there were pitchers of water at the entrance to the dealer’s room for everyone. Drinking too much water, however, means you have to go to the bathroom a lot. Try to time your bathroom breaks on downtimes so you don’t miss a sale or a potential interesting conversation! I was on three different panels/events so I had to close down my table for an hour each time. This wasn’t as bad as I thought it would be–I just put up a sign that said I’d be back in an hour, and had directions on what room I’d be in! I also took some merchandise with me to sell at the autograph session I participated in, and also, my book reading. This was how Richard Hatch of Battlestar Galactica fame ended up picking up The Violet Fox. Another word on having help: if you decide to take a friend with you to help sell your books, make sure your friend KNOWS your books. You’re not there to gab with your bestie. You’re there to SELL. Teach your friend all of your log lines and elevator pitches. Give your friend free books before hand so that she/he knows the story intimately. If you decide to share your table, make sure the person you’re sharing with has complimentary items for sale. Pairing up with another author might seem like you’re inviting competition, but being beside another bookseller can actually attract more sales–because it looks like you have more books, and more things to look at. I was next to a large second hand bookseller and I think strategically this was a good move. 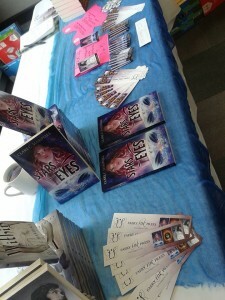 Lots of people came my way and lingered, so they at least SAW my logo and my pretty covers. Say hello. Don’t jump on them like they’re a piece of meat. If people are interested, they will come over and touch your books. Let them. Don’t start your pitch right away unless they look really interested/ask you about the book–let them take it all in. Smile. Don’t look unhappy. Try not to look hungover, either. Why would I say that? Because all the cons I’ve been to have awesome parties, and if you’re staying at the hotel, you might get swept up in them. Drink responsibly and remember again: you are there to SELL. You are representing your brand. Have fun, don’t go crazy, and try not to look like poop the next day! Sitting at a table with a blaring hangover is not fun. Trust me on this. As my late grandfather used to say, “Tired is in the mind.” So I grew some balls, ate a Larabar, repeated Poppy’s mantra to myself a thousand times, and I did eventually feel better. Being an attractive young lady myself, this is extra true. Be prepared. Be assertive. I love it when people come talk to me and tell me what they’re up to. But when it feels like they’re talking AT you, when you haven’t gotten in a word for 20 minutes, and you’re just sitting there going “uh-huh”–then you have a problem. Penny Arcade’s Strip Search series had an episode where the contestants had to set up a convention table, and then try to sell their wares. When someone annoyed them, the artists asked the annoying person to get him or her some water. This is a pretty good technique, but it could also invite more unwanted attention or conversation. Politely ignore them if possible. And if they are heckling you, ask them to leave. You are paying for the table, this is your space. Do not make a scene if possible, but make it clear that you do not want them present. Fortunately I’ve never had this kind of negative experience! This is where having a wingman (or woman) with you could come in handy. One down, two more conventions to go! 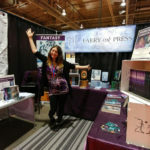 I’ll be here in Calgary for When Words Collide–in the dealers’ room, doing presentations and panels, and also doing a reading–and I’ll be in Halifax for Hal-Con, selling books like nobody’s business. Question: do you think it’s easier to get into a con if you’ve set up a publishing name, rather than if you’re just selling yourself as in indie author? Firstly: tables at cons are first-come, first serve. Or by invitation only. Basically, if you have money, and you get there fast enough, you get to sell your stuff, as long as it’s related to the convention’s theme. I will say, though, it’s probably more in your interest to have a table at a con if you have multiple items to sell. If you’re looking to participate in programming, it’s as simple as emailing the programming director and explaining who you are and what you do. Programming is volunteer so they’re always looking for people to participate usually, as long as you have something useful to contribute. I’ve never had anyone tell me I’m not “legitimate” enough just because I publish my own wares. Whether this is because I can sell myself well, or because I have publishing experience, or a little bit of both, I can’t really say.